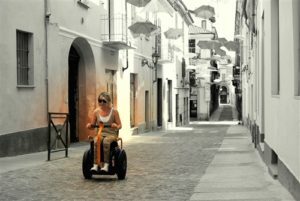 Forget everything you think you know about powerchairs and meet the Handytech Going Segway Chair. This revolutionary powerchair uses a combination of self-balancing technology and mechanical controls to create a unique, stylish and high-performance mobility aid. What’s more, it’s now available to buy at Mobility Solutions. Collaborating with a team of physiotherapists, the comfortable seat and backrest have been carefully designed for maximum convenience and comfort. The Going has been produced to ensure the user has a position similar to any other powerchair. The seat cushion is water-repellent, making it worry-free outdoors and the ergonomic backrest is height adjustable to work in harmony with your body. The materials used for the seat have been specially treated to make it robust and able to withstand the weather if you get caught in the rain. The Going chair is designed to give freedom of movement over long distances and to allow users to move into areas they wouldn’t usually be able to on a standard powerchair. Its hard-wearing 15-inch wheels give a strong and stable base, so you are comfortable and safe. The impressive wheel size allows the chair to be used on any terrain and in any weather. Whether you want to get outdoors and enjoy the countryside or simply nipping out to pop to the shops, the Going chair is your ideal companion. Get out any time of day and feel safe and visible by making use of the front and rear LED lights. The Going chair is built from the ground up with sophisticated technology in mind every step of the way. Compact yet powerful, the Going chair uses self-balancing Segway technology to give its user complete freedom of movement. Powered by the backwards or forwards movement of the torso, the Going chair is ground-breaking in its unique InfoKey controller, which can be removed for security has a digital display and gives a real-time display of battery life speed. Not only that, but should you need to charge an electronic device, you can do so on-board with its built-in USB port. It’s easily transported when going out and about, simply by using a hoist to transfer it into your vehicle. Want to know more about the Going chair and how it works? You can download the full manual here.